"On our feet or lying down...we're still training your pet!" Our training involves using many different techniques to build the puppy or dog for this venue. Charlie Tanner working with K-9 Pepper. The DGSDC feels it takes many different "tools" to get the best results from our dogs and puppies. Thinking outside of the box and using non-patterned training scenarios are but a few of the techniques you'll see here. We aren't a sport dog club like Schutzhund, IPO, PSA, or one of the other groups. Our methodology focuses more towards real life applications, needs, and training.The majority of our club dogs are family companions and not guard dogs or law enforcement dogs. All aspects of our K-9 training start with basic on-leash obedience and marker training. Obedience training helps the handler establish limits or controls with their dog. Secondly, it helps to create a bond between handler and dog. The bond reinforces the fact that YOU are the PACK LEADER. 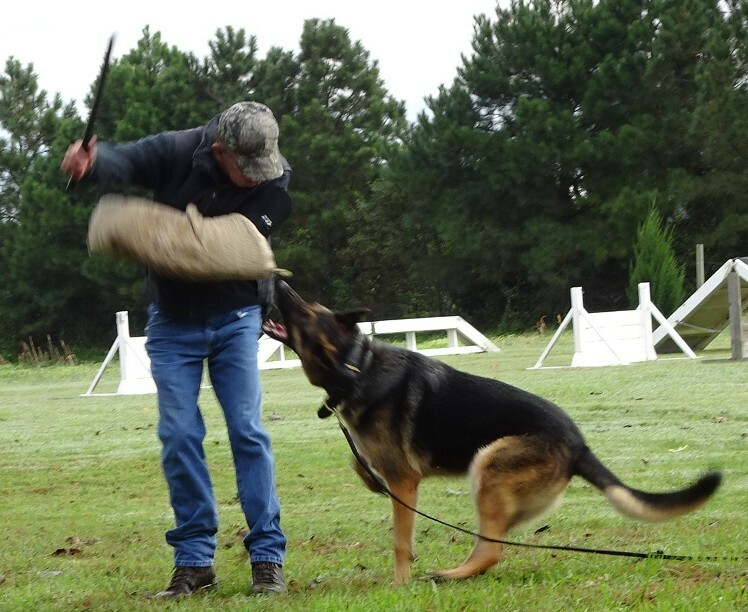 Lastly, obedience training builds confidence in the handler and the dog team. We said TEAM because it's a group effort. You'll never leave your dog with us because everyone has their own to train! Our protection training isn't ATTACK TRAINING, nor are we making the dog "mean." We feel these aren't accurate statements. 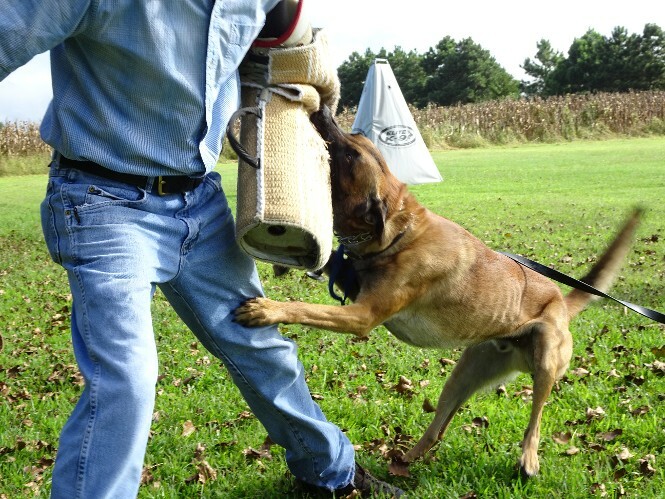 K-9 Personal Protection training is a more accurate way to define what we do. Our dogs should be viewed as personal and property protection tool. The club helper/decoys are the sparring partners for the dog. The handler serves as a coach to support the dog in each step of training. 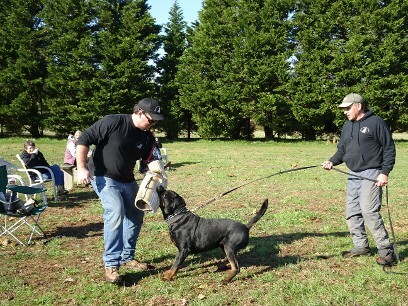 Working dog training requires many skills and the experience to understand drive/bite development. It's something you won't get from watching videos and DVDs. Our goal is to create the BEST total package with our dogs. We offer a variety of things that interest most folks. And Fun...Yes, Lots of Fun! Yes, we work with other breeds and mixes...like K-9 Aramis, a Belgian Malinois. Before you rush out and join a training club, investigate it first. Know who is in the sleeve or suit and see what they're doing! Almost anyone can put a sleeve on a take a bite from a dog or puppy. Before starting that working dog membership, you need to see what the club is doing with the dogs they train. It's our opinion that heavy handed training, loads of defensive pressure on puppies or young dogs can ruin them or set you back in training time. Education and training rely on many elements, strong handed training shouldn't be one of them. The DGSDC uses "slip and win" techniques with our protection work. Not all dogs or handlers are the same, they don't have the same skills, and the dogs don't come with the same genetics or ability to learn. Wouldn't you like to get it right the FIRST TIME? 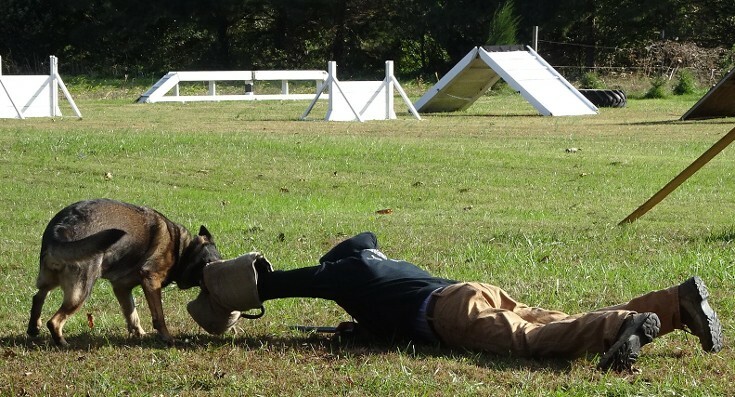 We use different techniques in the training and development of each dog. Protection work requires an understanding of what you wish to accomplish and the ability to get there. Here, creating a "miss" is one way to increase drive and a harder commitment into the bite tool, the sleeve. Howard Gaines III working with German Shepherd, Chanel..
What's the right age to start puppy training and what can they do? Time lost can never be regained. We feel the best time to start is after your puppy has a few vaccinations and is about 12 weeks of age. Imprinting and early marker training help puppies move quickly in this new environment. Crated puppies can watch the training and handlers can also learn during this period. Early rag work, obedience training, and the AKC S.T.A.R. program are some of the options. Dog aggression can never be accepted, it can showcase into other bad behaviors down the road. Early redirection, obedience, and corrections help reduce this issue. If it isn't fixed, your puppy or dog will not be able to train here. Why isn't this club affiliated with one of the dog sport venues? When it was formed, we opted to focus our training towards real world applications and individual needs. 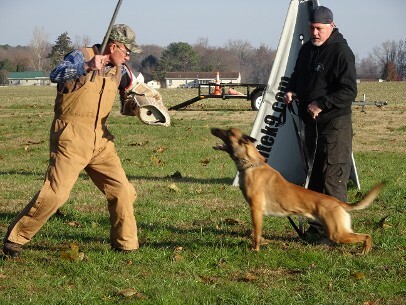 With Schutzhund or IPO, you will find many clubs want you to train in all three venues: Tracking, Obedience, and Protection. In PSA and some of the other groups, when was the last time you were attacked with spray string, tennis balls, or streamers made of plastic bottles? Our focus is on real application uses; the stuff most folks want for their dog. Good practical obedience on and off leash and protection when needed. Will doing protection work make my dog mean? "Mean" is a human emotion. The DGSDC works with each dog's genetic background and the handler's skill level to help provide training that is both positive and productive in nature. Each puppy or young dog learn how to bite and when to bite. As training increases, the TEAM learns to many new skills that help make the German Shepherd more comfortable with the protection venue. Remember, obedience is the FIRST thing that is taught...only a clear thinking, will obedient animal can move to the protection phase! How long does it take to have a trained protection dog? It all depends upon the genetics and the training put into each dog. We feel training is a LIFE LONG undertaking, nothing is ever "finished." Furthermore, it's impossible to say how long it will take as each team is very different. Before you come out...here are a few points YOU must understand. Each member understands when they train with us that handlers have different skills levels, different training backgrounds, different needs for their dog, and even the dogs have different genetic backgrounds with some being social and others very serious. Weather and field conditions can impact training, equipment can fail, and accidents can happen even with reasonable safeguards in place. When training with the DGSDC, each member acknowledges that they have read, understand, and agree to be responsible for the safety of their dog, guests, and themselves. For safety reasons and due to the nature of this training, children under the age of 18 and adults who are under the care of adults are not allowed to attend. While training or having an assessment with us, you agree to hold harmless for any damage, theft, loss, death, or injury, and regardless of occurrence the following, but not limited to: the DGSDC, other guest training clubs, club members, trainers/decoys/helpers, businesses, property owners and farmers who may work the land, or other unnamed assigns. Reasonable safeguards are in place, but accidents can happen and do happen. Be mindfull that this is not and will never be an accident free environment. Expect equipment failures, sprains, dog bites, trips, falls, broken bones, cuts, overheating...it impacts both human and dog. Ultimately, it is the K-9 owner who shall be responsible for the proper animal care, training done, equipment used and selected, the animal corrections or rewards given, and the overall safety of that team. Please use care when curbing your dog or puppy. All animals shall be safely and securely crated in or near the vehicle. When transporting your dog to and from the training field, be mindfull of others and their dog who might be near you. Don't touch someone's animal without asking, don't talk to it or get in its space, for safety sake ask first and then assume your own risk! Some dogs and puppies are social and others are very serious...why take chances?